Once you have completed the preparations, you can start removing the packages you no longer need. Thanks to the autocomplete function with the tab key, which also works when entering the package name, and the typical Linux copy-paste function with the middle mouse button, handling the long file names is no problem. Table 2 shows some commands for deleting kernel packages. As with all active package management activities, you need root privileges on the system to delete kernel packages. The fact that the kernel packages within a distribution typically start with a uniform name, and that the commands allow wildcards, means that you can delete all the kernel packages of a version with a shortcut. The last column of the table shows some examples. If necessary, add more packages or wildcards to the call. The commands shown in Table 2 provide an overview of the subsequent actions. Pay special attention to this output if you are using wildcards, and cancel the action if necessary. All commands let you specify multiple packages. Removing a kernel version also deletes the corresponding entry in the boot menu. Some distributions draw "logical conclusions" and sometimes delete more packages than specified. For Fedora, deleting the kernel modules or kernel core packages also deletes the kernel (Figure 3). Figure 3: In Fedora, deleting the modules will delete more packages. Some of the distributions have their own tools for handling the kernel packages. The following sections describe a few of those tools. By default, Fedora limits the number of installed kernel packages to three; CentOS sets the limit at five. The value of the variable installonly_limit determines the number. Fedora understands installonly packages to mean packages that can be updated via the package manager, but the old version is not deleted until this limit is reached. Fedora sets this installonly_limit value in /etc/dnf/dnf.conf; CentOS sets the value in /etc/yum.conf. If you leave this value at 2 or higher, a fallback kernel always remains on the disk . To edit these files, you need root privileges . Be sure you make a backup copy before you make any changes. 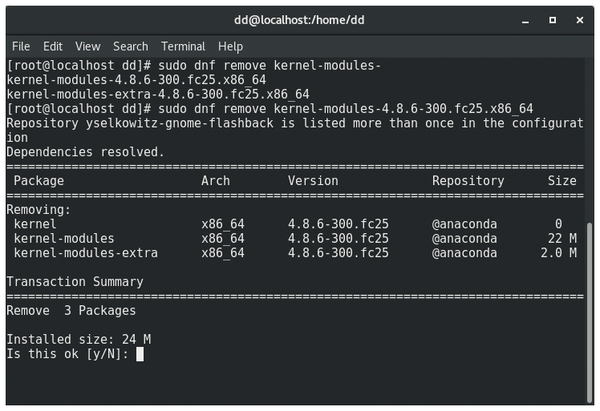 Using the Package-config tool from the yum-utils package, CentOS gives you a simple approach to deleting previous kernel packages. The yum-utils package is installed by typing sudo yum install yum-utils. The sudo package-cleanup --oldkernels --count=2 command deletes all kernel packages except the last two. The Synaptic program is part of many Debian-based distributions. It is installed by typing sudo apt install synaptic. Depending on the distribution, the call is either synaptic or with synaptic-pkexec. Alternatively, you can launch Synaptic via the application menu. 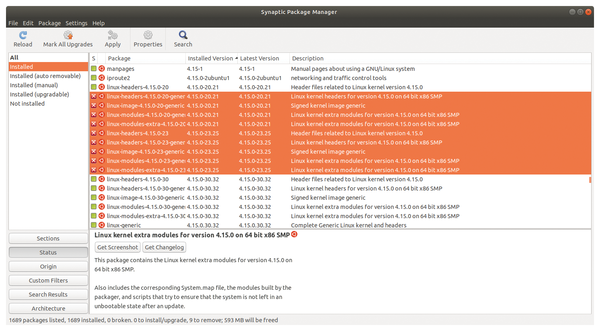 Here too, it is a good idea to first determine the version of the currently running kernel by typing uname -r. To quickly access the kernel packages, launch Synaptic and set the Status to Installed in the left part of the window, click to activate the area where the packages are listed, and type linux. Mark the packages (*image*, *header*, etc.) of the old versions and select the entry Mark for complete removal in the context menu (right mouse button, Figure 5). Clicking on Apply starts the de-installation. See the box entitled "Debian Automatic" for additional information. Figure 5: Graphical software management with Synaptic. Where software requires further packages as dependencies (e.g., libraries for extended functions), the package manager automatically includes them when installing the application. If you remove the program from the system again, these additional "orphaned" packages often remain on the hard disk without serving any useful purpose. 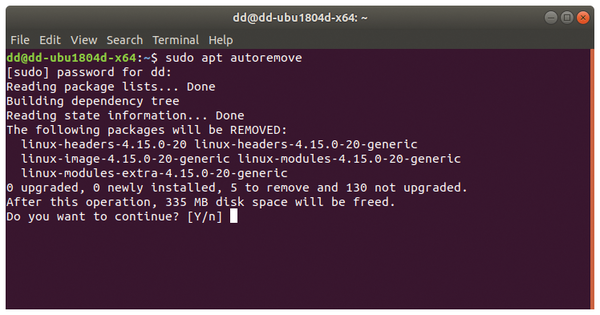 The package managers on all Debian-based distributions (including Ubuntu or Linux Mint) have a routine with the sudo apt autoremove --purge that lets you remove this unnecessary ballast from the system. In addition to the orphaned packages, the command also cleans up the kernels (Figure 4). This automatic procedure keeps the current and the second-to-last kernel on the system. If the routine ignores the obsolete kernels, it may be because they are tagged as "manually installed." The apt-mark showmanual | grep linux-image command lists the packages (and filters out the kernel packages immediately). If you then change the status by typing apt-mark auto package_name, the caretaker should now clean up the kernel packages as well. Figure 4: The apt autoremove command removes unneeded packages from the hard disk on Debian and its descendants.